The newcomers had come to the Loudoun Valley in search of fertile land; most of them were farmers first. But as the little community grew there was need and opportunity for other skills and services. In the 1730s and 40s, for instance, Amos Janney made a name for himself in the Northern Neck as a surveyor. And since the settlers' chief crops were grain, he also saw a profit to be made as a miller. With his surveyor's eye, Janney surely had in mind the power potential of the South Fork of Catoctin Creek and its tributary Balls Run when he bought his original 400 acres. We know that he soon built a simple mill of logs to harness that power. That mill is said to have been across the creek from and a hundred or so feet upstream of the mill we know today. It not only ground grain but sawed logs into beams and planks. Curiously, Janney built on Francis Hague's property-there must have been a strong handshake between the two Quaker relatives to bind that bargain. Mahlon eventually erected a larger, two-story mill "of wood and of stone" on a near-by site, which he eventually bought from his Uncle Francis in 1762 "with improvements thereon." 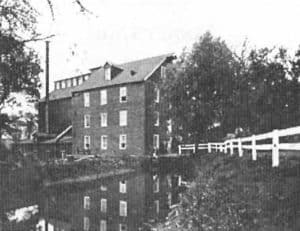 For more than half a century after the family's arrival the tiny settlement that developed around the structure was known simply as Janney's Mill. Over the years many other mills were built in the area, but the one Waterford now calls simply "the mill" remained the best known. As a youngster I helped drive cattle for stock dealer E. H. Beans from the railroad at Paeonian Springs to Waterford. These cattle were resold to farmers who would fatten them for slaughter, then sell to a dealer or a buyer for a packing house. Mr. Beans had a border collie, Laddie, who was equal to two or three boys in handling cattle on the road. Laddie knew every side road or open gate between Waterford and the railroad. He would get ahead of the herd and be standing at the opening when the cattle got there. Once the drive passed this trouble spot, he would take off across the fields and be waiting when the first steer reached the next such temptation. He was a valuable little dog. But I have gotten ahead of myself. If we could return to Janney's Mill as the American colonies neared revolution, we would find the place still just a small settlement. Along the boundary between Janney's and Hague's land, a blacksmith shop and tannery were apparently operating in addition to the mill. These three industries would have been essential to the growing agrarian economy. We do not know much about the blacksmith shop, but the area just south of the scales across Liggett Street was used for many years as a tanyard. A 1785 deed description mentions as the Tanyard Branch a little spring-fed stream that crosses Main Street about a hundred yards south of the mill. From this we may assume that a tanyard was in existence before that date. There were actually two tanneries in the general area-they may have overlapped for a time. The upper tanyard was owned first by William Hough (1744-1815) and son Joseph (1770-1806), and later by Joseph Bond. The vats were a series of pits in the ground where the hides were soaked first in a caustic lime solution to loosen the hair, fur or wool then in a strong brew of oak or other bark to tan or preserve them. A building stood there partially covering the vats. Those pits are still visible today beside the Tanyard Branch in what we now call the Bond Street meadow. The Janneys and Hagues were soon followed by other Quaker families: Taylors from Falls Monthly Meeting in Bucks County, Browns, Williams (1760s), and Moores (1780s) from Gwynedd and Uwchlan Meetings-all in Pennsylvania; Bonds and Walkers from the same colony via Hopewell Meeting in Winchester, Virginia. The Houghs and Steers had also arrived by 1765. All would play leading roles over many years in the development of Waterford. In practice, another factor may have been more important for those who would settle in Cameron Parish (present day Loudoun County). The parish minister appointed in 1749, one John Andrews, was said to have been constantly in debt, with alcohol his constant companion, and unable to police his parish. He was separated from the ministry in 1768, but by then non-Anglicans were firmly established around Waterford and elsewhere. Whether Scotch-Irish immigrants or Pennsylvania Quakers, most of the new-comers lived well outside Janney's Mill. On the site of the future village itself, few lots were available for building because Francis Hague and Mahlon Janney still owned most of the land. That situation finally changed in 1780 when Hague died. His will directed that his lands be sold, wholly or separately, and the following year his son and executor Thomas sold 12 acres to Joseph Janney." In short order, lots were marked off on the north side of Main Street, and in 1791 Janney laid out 15 more along the south side, from the Mill almost to the existing Post Office-divisions that are clear to this day. In 1800, Mahlon Janney, continuing the momentum, began selling lots on the extension of Main Street up the "Big Hill," and in 1812 when he died, his executors subdivided his land along Second and High Streets. By the turn of the century then, nearly 70 years after Amos Janney's arrival, the little settlement was beginning to take on the appearance of a real town.